Interview with the Doctor,. 18 September 2016. I am a doctor. I work at the rural health centre in the Shakhrikhan area. We have been sent out to pick cotton since 6 September. Each year I go to gather cotton. Mostly they send nurses to do it. But when there are not enough people, they even send doctors. This year, they gave the cotton more serious attention and the doctors now also have to go. 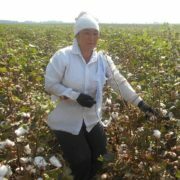 I just came from the cotton field, having been there for 10 days in Ulugnor district. We are living in the school which was given over to a local farmer. I do not know where the local students went while we lived in the school. In 10 days, I never saw any students. They said the students had been transferred to study at another school. Where else can they accommodate 370 hasharchi (helpers) like me if not at the school? I count every day. There is a younger daughter too who graduates from college this year. She also had to pick cotton. 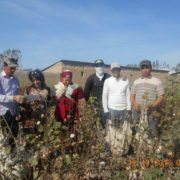 All students from Shakhrikhan are on the cotton fields. This year, as before, I was preparing for cotton gathering the whole summer. In summer I gathered dried bread and made “tolkon“ (pounded dried bread) with sugar and put in empty plastic bottles. I took dried apricots and apples. And then took a jar of jam. I also got butter with 3-4 “lepyoshka” breads. All I got was from the house. I did not buy anything at the market. I took warm clothes, put on warm “mahsi” boots on my feet. And so I was ready for the cotton gathering. At 7:00 am on September 6, I came to the district healthcare building. 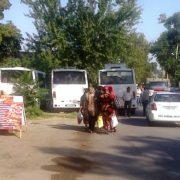 We were taken in buses to Ulugnor. I am a general practitioner. There are four ambulance cars at our hospital. Two of those cars were left at the building and two others were used to take 10 people to the cotton fields. The remaining two doctors are supposed to handle all the work themselves. Two patronage nurses also went with us. The rest of the people on the fields are from „the mahalla“ or surrounding districts as well. However, this year no one has left the field the whole summer. You come to work and you are told „Go to the field and collect caterpillars from the cotton“. You come to the farmer and the farmer tells you „Go away, there are no caterpillars in my cotton fields, you might be bringing them and infecting my fields.” The truth is, not all fields have caterpillars. In general, most of the summer we spent in the fields rather than at work. Oh and we become masters of catching caterpillars! Now we pick and gather cotton. This year’s cotton is not bad, but not good either. At some cotton fields there is very little cotton, just 40-50kg, and sometimes you can collect 60 kg of cotton. I collect 55-60 kg. 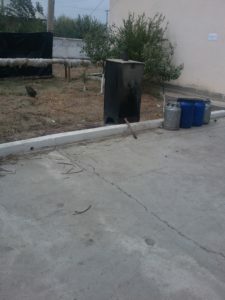 At school, where we are staying, the living conditions are poor. The school is big. There is even a laboratory for physics, chemistry and mathematics. Yet, there is no water. And there is no water even to drink. We ourselves, and sometimes local organizations buy10 litres of drinking water from shops. We pour water into a container and take it with us to the field. We even spent the Eid holiday on the field. I asked permission for absence of leave as I was supposed to send a gift basket to a brow (at the Eid holiday people send this kind of a holiday gift), but I was refused. I tried not to buy anything. I had 20 thousand Som in my pocket. I spent most of my money on bread. I tried to collect as much cotton as I could in order to earn a little money for home. For 10 field working days I received money just once for Eid. For five working days I received 88 thousand Som (14%). For the remaining 5 days I was not given anything. They promised to pay us every day until we left, yet they never paid. Once I arrived at work I mentioned it and they said it would be paid the next time all together. And that money is actually not enough even to buy a stroller for my grandson. farmer has left. This is because at least some help is provided to the family. There is a family who gathered 150-180 kg of cotton together. They do not even eat the food the farmer provides so that the farmer does not charge them for it. They bring their own food and eat in the field and drink from plastic bottles filled with home made tea and go back to work again. 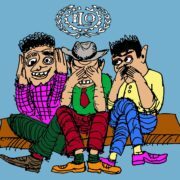 This way they can earn up to 30-40 thousand Som per day (5-6 %). And let’s say they earn 2 million Som (317$) for the season . Is this money you can survive with? Will there be anything left by the middle of winter? How do they get by until spring? Poor people?? Such families have no profession. After all, to get a profession, one needs money too. If there is willingness to learn, the colleges do not teach well, and for private tutors money is required. These poor people live like the back leg of dog (not needed). They and their children and their children’s children will have the same life. So many people are working in the cotton fields, but the farmer doesn’t even treat people properly. All the time he is just screaming and yelling. He has the same attitude towards mardikor (hired workers) who are hired for their money to work at backyard He was shouting and yelling at me too: “Why are not you picking cotton well?” I said, “I am a doctor and should not be collecting your cotton. Many patients are waiting for me. Take your apron,“ and I left the field. It was about 3-4 pm. I just went back to the accommodation place where I rested till evening. Friends weighed and recorded my remaining cotton for me. After my words with the farmer, he walked the fields without saying a word till the evening. The next morning I quietly went to the field. Even at my side, he did not say anything. The school building is very cold. He took two thick blankets but we got frozen anyway. On the second day my husband brought another warm blanket. Taking pity on me, he said “Come on, forget this cotton. Let me give them $100 and maybe you can be released.” I told him, “Oh, come on, you had better give the money to me. I still need to buy a lot of things for my grandson. Part of the money would be spent on that.” He was offended and said “But your health is more valuable than the money.” He brought a lot of bread and samsa. We sat with the women and ate. Everyone here has visitors. Sometimes I wonder how my daughter is. She is a student. We prepared food for her. But she’s still young! Finally, we completed the 10-day compulsory cotton picking and returned home. At the medical station the work had accumulated. Would someone else carry out someone else’s work? There are not many patients during the cotton season. But this time there were a lot. And only a few doctors were left. If no specialists are here, the patients are referred to the district medical centre. There is no other way. And laboratory staff are on cotton picking too. We have to send people away who come for tests, saying there are no reagents. Of course I am against the cotton harvest. I believe that none of the people benefit. I collected and my mother, my mother’s mother, and now my children collect cotton. Time will come and this baby (grandson) will collect the cotton too? I am worried! In different places and in conversation with different people, they all say that this year’s cotton season was worse than last season. Many believe that this is because the state now has no president. There are not the right conditions for cotton growers and helpers on the ground. Before, they installed a dozen basins, cotton growers were provided with free soap, toothpastes and toothbrushes. This year there is nothing like that. At some places there is not much food, not even pots for boiling water. It was only when cotton picking started, that they started to bring things. Cotton picking helpers are accommodated in the school building. Students who are there to study are sent to other schools, because now all school students study in one study shift. Probably students of schools where cotton pickers live study in the 2nd shift (in the afternoon and evening) in neighbouring schools. Because everyone says that they did not see students. Each organization assigns 10 assistants for picking cotton. In addition, the district public education authority allocates 10 cotton pickers from each school. Representatives of education institutions are separate. These cotton pickers are all forcibly sent to 10 days cotton harvest in the areas of Buz and Ulugnor. 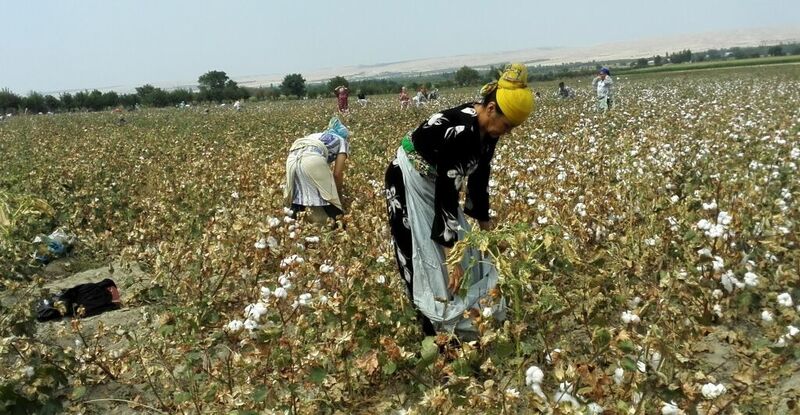 Organizations from each district should allocate 400 cotton pickers all together. And the same amount of pickers from educational institutions. All costs of buying food for pickers are allocated to these districts. 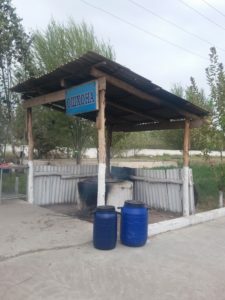 All organizations, schools and kindergartens for cotton pickers should allocate: – 30 kg of sugar, a big bag of rice, a big bag of pasta, 10 kg of cottonseed oil and more. On top of that, all money spent on these products by organizations is taken from the wages of employees. 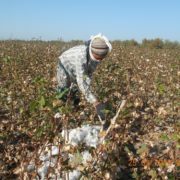 In addition to these cotton pickers, the organization must send its 10 employees to pick cotton. At weekends (Saturday and Sunday) 100% of the staff go to pick cotton. Among collectors, there are students from schools and colleges. Some of them come instead of their parents. Others pick cotton to make money. Of course it is not money paid by the state , but the money for picking cotton for others. 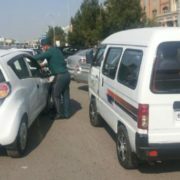 The cost of paying a hired worker is around 30 thousand Som per day ($4,7). Some say that they agree to pay 50 thousand (%7,9). 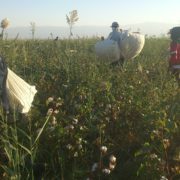 Students of local district colleges pick cotton in the daytime. Name of the doctor is not disclosed at her request.